See what they're saying about Cat Eye Club! 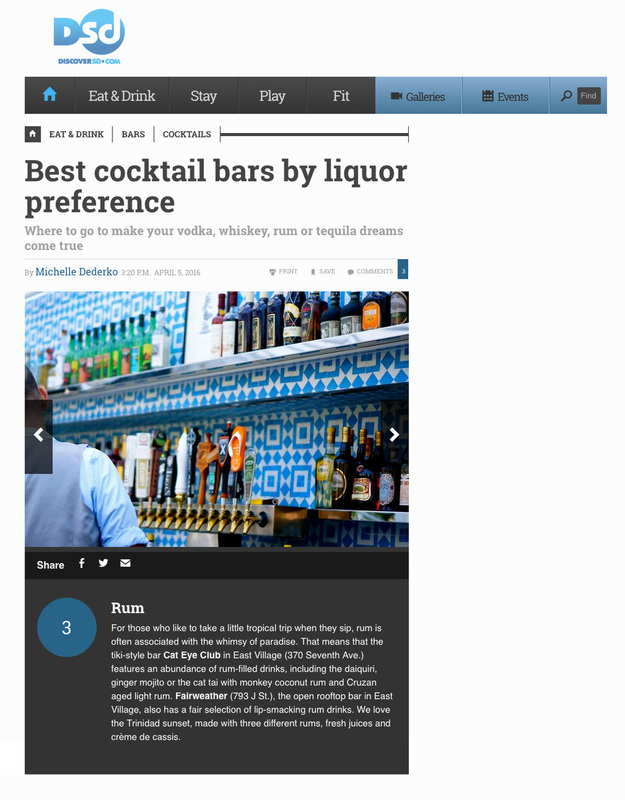 Eater San Diego lists Cat Eye Club as one of the hottest must-visit cocktail bars in San Diego in February 2017. Cat Eye Club tops the CityBeat list as a place to eat once pot becomes legal with the Bacon and Shrimp Machete as the main attraction. Los Angeles Magazine lists Cat Eye Club as an essential stop for tropical drinks and tiki culture in southern California. Cat Eye Club makes the list as a top place for craft cocktails in San Diego boasting their mid-century and tiki vibes. Zagat ranks Cat Eye Club’s cocktail, Goonies Never Say Die, as one of the most visually stunning tiki drinks in San Diego. Served in a smoking treasure chest, you’ll find a mix of Appleton signature blend, orange juice, lime juice and grenadine instead of gold. DiscoverSD boasts Cat Eye Club as the best cocktail bar for those looking for a tropical rum trip. The Nardcast got the scoop on bartender extraordinaire, Misty Marries and how she creates the classic Scorpion Bowl at the Cat Eye Club. San Diego Tourism Authority compiled a list of venues where one can drink like a San Diego local. At the top of the list, Cat Eye Club is a retro-inspired cocktail lounge and tiki bar perfect for a signature cocktail in an intimate setting. 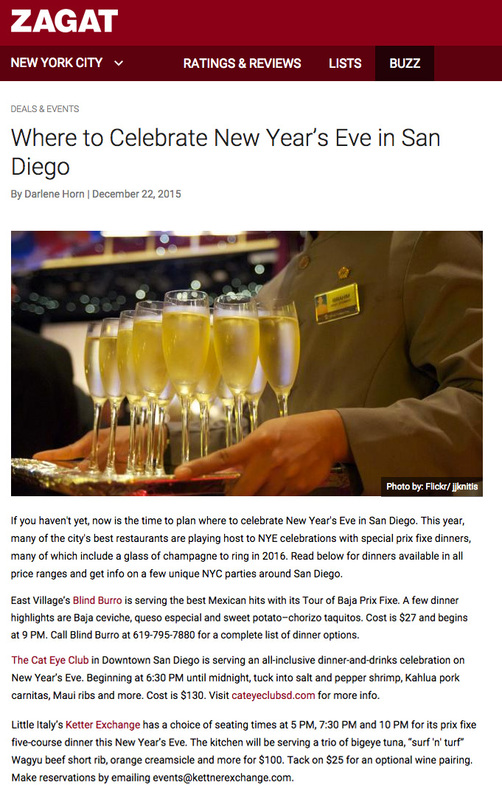 Eater San Diego includes Cat Eye Club as a top place to be at on New Year’s Eve for exotic food and entertainment. Patrons can enjoy an all-inclusive dinner and drinks plus burlesque show. ZAGAT suggests Cat Eye Club as a place to spend New Year’s Eve in San Diego with their all-inclusive dinner and drinks celebration. 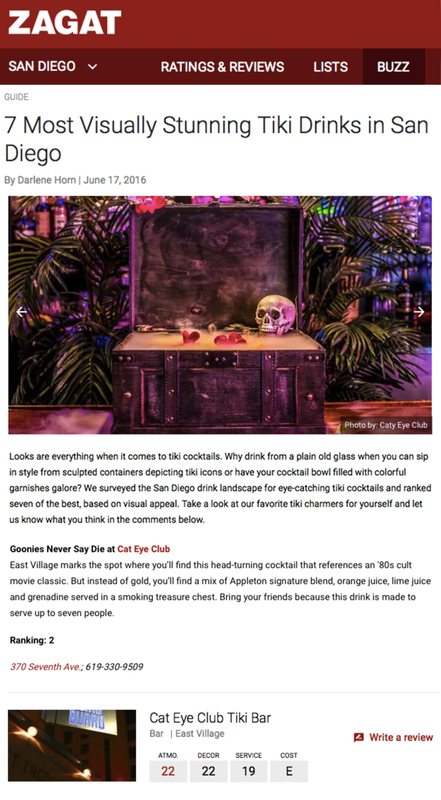 Locale Magazine ranks the Cat Eye Club as San Diego’s Go-To Spot for Tiki Cocktails. The San Diego Reader reviews Cat Eye Club’s transition & revamp to a new classic cocktail & tiki-inspired drink & food menu. Eater gives an insider look at the Summer launch of Cat Eye Club’s new tiki inspired food and tropical cocktail menu.